I'm going to have Luke sit on the ISD nose (can I do that). I'm going to use the Navigate to slow down. Movement one click on the first knuckle to the left. 1) Yep - you can put Luke anywhere you want, so long as it's touching the ISD. 2) Roger that! Decreasing speed to 1. You can also do 2 clicks on the knuckle if you want to. You can shoot Gamma Squadron or the ISD, but not both (same hull zone). Vs. Gamma, you're rolling a blue and a black; against the ISD, you've got your full port battery. The Defiance continues to pour coherent light into the approaching ISD, hoping to break through its freshly-reinforced bow shielding. 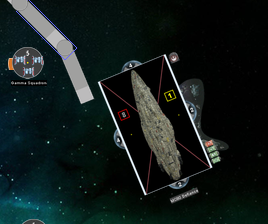 Defiance elects to attack only from its port and starboard batteries; Ackbar is activated. 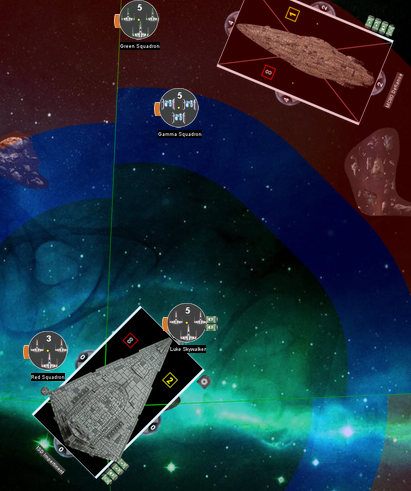 Attack is at medium range, so all dice in its battery can be used: 3 red, 3 blue, +2 red for Ackbar. Impertinent has activated, so Defiance triggers; +1 blue. No other modifiers, so the final attack value is 5 red, 4 blue. Results are 6H, A, C.
Impertinent has 4 defense tokens available: Brace (1/2 damage, rounded up), Redirect x2 (take damage on an adjacent hull zone), and Contain (prevent a standard critical hit). @Betsuni, do you want to spend the Accuracy result to prevent @Fuselage from spending a particular defense token? I want to spend the Accuracy to prevent Brace. Edit: What would 2 clicks look like versus 1 click? You cannot Brace on this attack; did you want to Redirect and / or Contain? (I'll assume, if I don't hear back, that you'd like to do both). Thanks! I'll go with 2 clicks then. Cool. Your RDR is up next; it’s got a Repair command and a concentrate fire token, and no targets in-range at the moment. Speed 3 (0-1-1); where do you want it to go? The Defiance's fire is accurate and powerful, and the freshly-reinforced bow shields on the ISD Impertinent fall again, leaving the ship defended only by its reinforced armor. The Defiance slews hard to port, working to keep its guns on the approaching juggernaut. 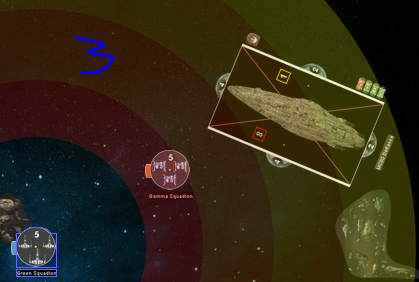 Impertinent exhausts a Redirect token to move 3 damage to its starboard side (Shields: 3->0), and takes the remaining 4 damage on the bow (Shields: 3->0; 1 hull damage). She exhausts her Contain token to prevent the standard critical effect. Meanwhile the Rebels send out some small hidden shuttles and convince the Raider and ISD to join them with Girl Scout Cookies and milk. The milk won them over and everyone leaves the quadrant for pizza and beer. As we all know, it is the Dark Side that has cookies. 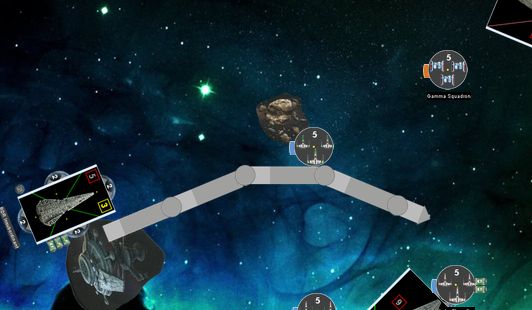 The Raider swerves mightily to avoid the asteroid in front of it! The Insubordinant activates with a Repair Navigate command and slows down (3->2; 2-2) and slides left (2 left notches at the first knuckle, 2 right notches at the second knuckle). 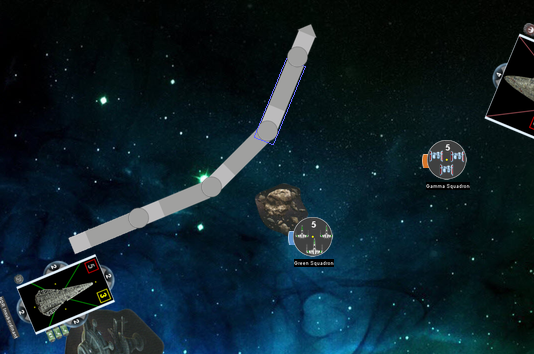 @Betsuni is up for the Squadron phase; you have 3 squadrons to command. Red Squadron and Luke Skywalker have shots on the ISD, and Green Squadron has a shot on the RDR. 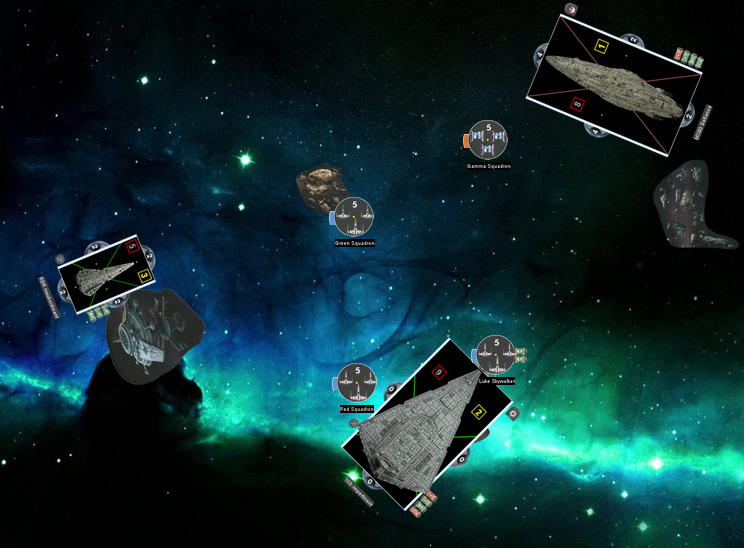 Or, if you want to move your squadrons, let me know and I'll toss up some range circles for you. Luke and Red Squadron will take on the ISD. While Green Squadron will fly closer to the Defiance to support it against those bombers. Okay - so you want to move Green Squadron to engage the bombers. Where do you want it? Please move them to where you wrote your 3. As long as they are in range of Gamma. Red Squadron and Luke Skywalker attack the Impertinent! Their shots boil armor plates off into space, but do no real structural damage to the behemoth. Red Squadron attacks first, and rolls 1 red die. 1 damage, and no real way to mitigate it, so it goes against the hull (9/14 -> 8/14). Luke Skywalker attacks, and rolls 1 black die. Also 1 damage against the hull (8/14 -> 7/14). That wraps up the Squadron Phase of round 5, which takes us to the Command Phase of Round 6, the final round. @Betsuni, @Fuselage, please submit your orders for your ships. S'alright. Work gets us all, every now and then. Just glad to see you're alive. Games can always wait. 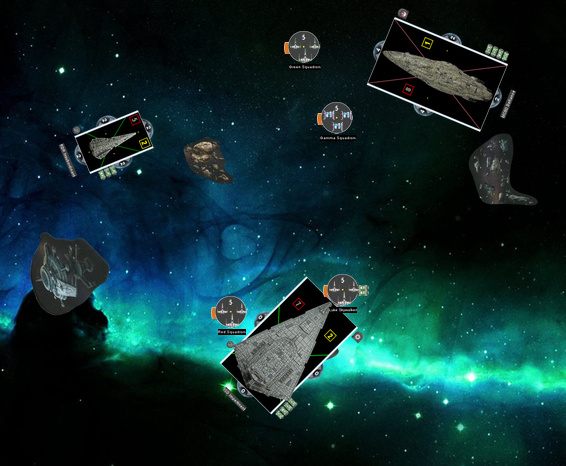 @Fuselage hasn't been able to make it to the boards since pre-Halloween, and since this is the last round, I'll just go ahead and run his ships for him so we can wrap this up. ISD Impertinent's crew scrambles to the main engine room, and locks down several cracked and venting fuel lines, effecting hasty battlefield repairs to keep the ship's mighty thrusters from pulling itself apart. 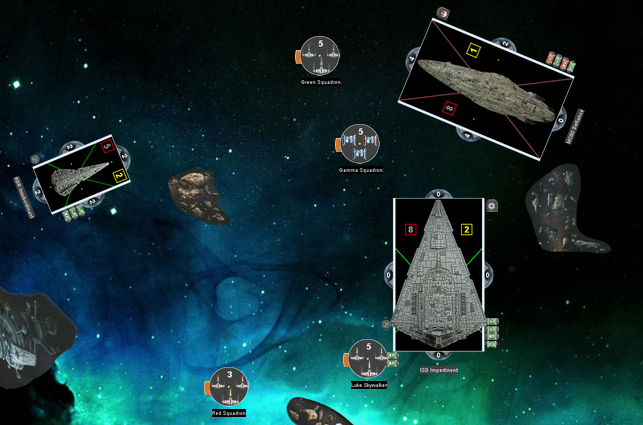 Meanwhile, the ship's antifighter gunners finally have a target under their crosshairs, and they open up on the X-Wings of Red Squadron, scoring several hits on the strike craft. 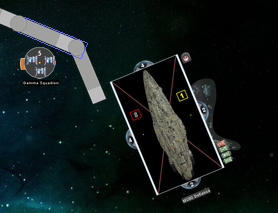 The bow gunners train their weapons on the Mon Cal ship in their sights, attempting to score some damage to the craft before it jumps away. The Impertinent activates with a repair command, good for 4 Engineering points. It repairs the Ruptured Engine critical hit (3), discarding it (Hull: 7->8); the remaining 1 point is not enough to do anything. First attack is port arc, using the anti-fighter battery - 2K. Results are 1C2H, which is 2 damage against Red Squadron. 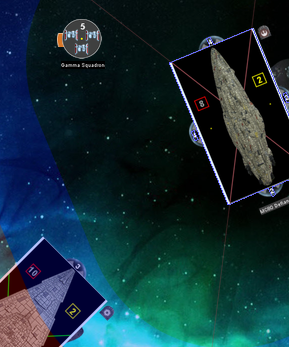 Second attack is bow arc, using the main guns - 5R (blue dice are out-of-range). Results are 2C2H, for 4 potential damage. @Betsuni to spend any defensive tokens (2 Redirect, 1 Brace, 1 Contain (likely not useful here)). I use 2 redirect to the aft shields. What does brace do again? Cuts the damage in half. So can I do that for the crits? If so, then let's do that as well. The way it "technically" works is that we acknowledge that a critical effect (2 red crits) is in play, and determine which critical effect we want to do. Then, we total up the damage, at which points the crits just count as damage points. So you can't use the Brace token to remove the crits specifically; you just take the pile of 4 damage (2 hits + 2 crits = 4 damage) and reduce it to 2. In this case, it's not super important, but if you had fewer shields remaining and 2 damage was enough to get a card through, it would be a face-up card unless you also used Contain. Ahhhh interesting. So playing Brace is indeed the better choice here. 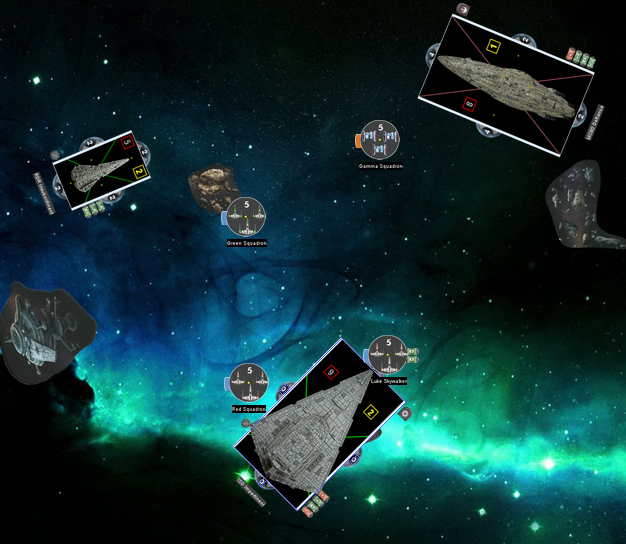 The Defiance's shields flare, and are weakened by the ISD's barrage - but largely hold, though significant gaps in coverage have appeared. Gamely, the Impertinent continues it's charge towards the Defiance. Impertinent moves ahead at speed 2 (1-1) as far to port as possible. @Betsuni, the Defiance activates, with a Navigation command. What's she gonna do? I think she is running at one speed right? If so the I will just "store" the navigation token. Yep - speed 1. And, this is the last round, so if you store the token you won't be able to use it. You could spend it to do an extra click of turn. Ah ok. Let's do that then. One click. But first, you shoot! Are you using Akbar this round? I forget, can I fire on both the ISD and Raider? It has been too long for me to remember (I tend to forget a lot these days being at work). Not from the same arc.